Axons require multiple cues to be guided to their targets, and many molecules that are involved in these guidance events have been identified. A general consensus has emerged that such molecular mechanisms are most commonly used for pathfinding to the target area and that it is only within the target that electrical activity contributes to the fine-tuning of the connections. However, recent evidences suggest that intrinsic rhythmic bursting activity plays a role not only in earlier pathfinding decisions but also for the establishment and maintenance of a precise connectivity. 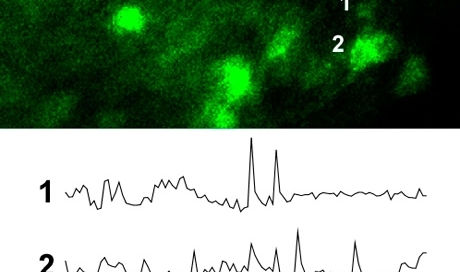 What is the role of spontaneous activity in the establishment of precise synaptic connections in the thalamocortical system? Our laboratory is investigating these questions by using a combination of cellular, molecular and electrophysiological techniques.